Before you teach them fetch, before you teach them shake and before you teach them sit, you teach them how to eliminate outside. No matter the age and no matter the breed, all healthy dogs are capable of being trained to go potty outside. Unfortunately, such a task isn’t always easy as dog temperaments vary from breed to breed, resulting in a widely skewed teaching time. Even so, there is always one aspect of puppy potty training that remains uniform no matter the dog – patience. Just like you will rarely be able to do something new correctly the first time, so, too, will your dog need a number of attempts before they understand exactly what you’re asking of them. Impatience is a negative emotion that fosters frustration and anger that is typically then turned toward the dog. Instead of helping your dog learn faster, these emotional outbursts teach them anxiety and shame, leading to even worse habits that are much harder to break. Now, instead of a young pup that would have taken only three months to housebreak, you have a young pup that is a year old and eliminates in the house when you’re not looking. Unlike teaching a dog commands, potty training is one of the easiest lessons since dogs innately know to not go potty in their den. Ideally, you’ll want to take them outside on a set schedule whether they have to go or not. Typically, a young pup will need to go anywhere from five to 30 minutes following their meal. When you go outside, take them to the same place you take them every day. The scent of their older eliminations will trigger them to go again. Remember that if your puppy has an accident, they didn’t do so on purpose. Puppies do not wake up in the morning with the desire to ruin your rug as vengeance for feeding them the kibble they don’t like. It’s a very bad idea to associate any form of negativity with a natural bodily function. Staying calm also means your dog won’t learn what your trigger is – something they could potentially use against you in future scenarios. Instead, remain neutral and bring them to their outdoor potty spot even if there is nothing left for them to let loose. As a final note, be sure to clean up the accident area with a cleaning agent that will remove the smell of feces and urine. 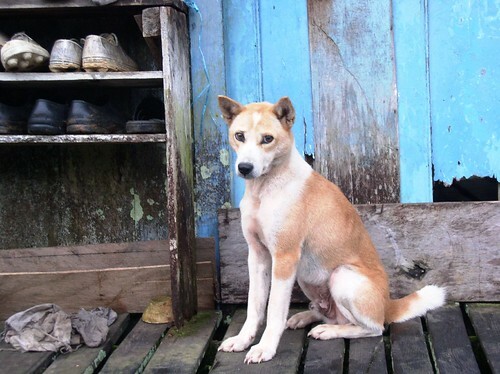 Dogs in the wild do not live anywhere near areas that smell like feces. Should this smell remain in the house, it will condition them to believe that indoors is a potty area. So long as you remain patient with your puppy, potty training is a very simple task because it is what the dog wants to naturally do. Stay positive, and they’ll be outdoor champs in no time. Most new puppy owners face a difficult decision when it comes to potty training their pups. Should praise or punishment be the technique of choice for reinforcing positive behavior? According to a study at the University of Pennsylvania School of Veterinary Medicine, researchers confirmed that praise works for new puppies learning potty training, while aversive training does not. Veterinary behaviorists surveyed 140 dog owners about their different training methods and their effectiveness as part of the study. Of those who rubbed their dogs’ noses in the house-soiled areas, not one person reported that the technique was beneficial. In fact, 89% stated that it had no effect, and 11% said it actually made matters worse. With these type of findings, any pet owner can see that praise is clearly the more successful route to go in. Start to incorporate positive reinforcement into your house training program, and talk with your dog trainer or veterinarian about other reward-based techniques to successfully train your dog to do his business out of doors. Halloween is just around the corner and most kids and parents are probably already getting ready with the costumes, candy, and plans with friends. However, for pet owners, Halloween takes a little extra planning in order to keep the pup safe from even the simplest of things. One of the biggest dangers during Halloween is the chocolaty treats that are so readily available. Whether it’s waiting by the door to get passed out to children or the debris left over from the night before, candy can find its way into your pup’s mouth very easily. Be cautious around youngsters, especially if your pup knows they can show off a little cuteness in order to get treats. Don’t let your pup wander around alone, and keep in mind that many adults don’t know better either. Keep all candy, not just the chocolaty stuff, up high in your home. Pups can be sneaky, and there are those that climb just like a cat. So, just because it’s up on the counter doesn’t mean your pup won’t give up trying to get a piece for themselves. Even your yard can hold on to leftovers long after trick or treating has passed. Be sure to clean up wrappers and scan your yard for any trash before setting your pup loose to potty. Even in small quantities, chocolate will make your pup sick. While we’d like to believe that everyone enjoys the companionship of a furry friend, there are still strange people out there that aren’t going to treat your pup as caringly as you do. 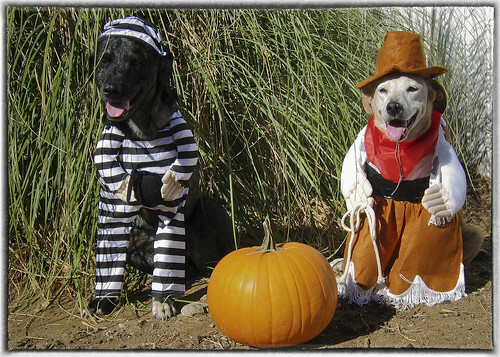 Halloween night is highly notorious for animal cruelty, mostly targeted at black cats and dogs (perhaps out of superstition or just plain stupidity). Just to be safe, don’t leave your pup unattended, even in your own back yard. There’s enough commotion and people walking around trick-or-treating that it’s easy for a dog to be puppy-napped. What about those fast rascals who just want to get outside every time the door opens, even if it’s just a crack? If your pup’s a runner, be sure they’re secured safely in your home, perhaps in a room by themselves where they won’t be inclined to make a break for it every time the doorbell rings. If you’re concerned for your dog’s safety and anxiety, putting your pup in a quiet, secure place in your home may be the best solution. Just be sure that you give them something to listen to and play with. Make it a party for them, and make sure they have a few treats of their own to enjoy as well. There are those furry rascals who do enjoy being a part of the team, whether it’s answering the door for trick-or-treaters or traveling with the pack and keeping their family safe while out in the neighborhood searching for goodies. Be careful when choosing the right type of costume for your pups. There are plenty out there on the market, but they don’t always make the budget or your pup’s “cool” list: not every costume is necessarily dog-friendly. Some hold in too much heat and become burdensome and uncomfortable. While your kids can tell you what isn’t working, your pup is either going to run with it anyway or take it off themselves–usually in pieces. That’s another thing to watch out for as well. Depending on the materials and ornaments, a fancy dog-costume can quickly become a toy for them to play with. Before dressing your pup in anything, make sure that you feel along the inside of the costume before putting it on your pup. Tags, pins, and even obtuse stitching can become a nuisance for your pup very quickly. Choose something simple when in doubt. A bandana or alien antennae will give your pup another personality for the night without getting too expensive or uncomfortable for your pup. Halloween is fun for everyone, even your pup; whether it’s by dressing up, offering the right treats to the right individuals, or being out there trying to find some treats to satisfy your cravings. Just be sure that when you’re planning a night of fun and entertainment, include your furry four-legged friends as well. Please feel free to offer other loving pup owners helpful advice that will keep Halloween fun and safe for everyone. This has been a much debated question for years. Some say that dogs have no memories (playing catch with their pal) while some say that their pup does remember their past, and even dreams it sometimes. As research on the subject raises awareness, it can be claimed that dogs do indeed have long-term memory. Like humans though, they don’t remember everything. This is because every dog is different. It’s like asking someone else to remember that time when you were out on the playground and so and so pushed you on the swing set. That experience may have impacted your life in some way that your brain felt necessary to keep stored away. In most basic situations, dogs have to remember certain things. Say your pup happens to get a hold of some nasty weeds in the back yard and munches them down thinking they’re good. As a consequence, their belly is upset and they learn from the situation. Next time they see that particular weed (or smell it) they’ll avoid it. Why? Because they remember that it isn’t good for eating. It is a memory, even if it’s vague, that this particular plant is not yummy for their tummy. This is perhaps what leads us to “educate” our four-legged friends. If they can’t remember what you’ve taught them, including the feeling of the experience, we might as well teach our pups the same old tricks every day when they wake up, which isn’t the case. Consider this situation: Your pup knows they’re not supposed to loot the trash can for snacks. They don’t do it while you’re there, or at least while you’re not looking. The funny thing is when you do get back home and discover what they’ve done, what is your pup’s first instinct? Most likely, they’ll already be asking you to forgive them. They may whine all kinds of excuses, including it was just too good to be thrown away and I thought you said it was okay, but they remember that they’re not supposed to dig in the trash. When it comes down to scientific studies, it has actually been proven that animals also have what is known as spatial memory. This is the reason why rats can run mazes, and why your pup will be a little aggravated when you move the furniture around (Hey, that table isn’t supposed to be there!). It’s because they possess the memory of what the world around them is supposed to look like, such as visiting a friend’s house and knowing exactly where everything is. Of course, this same scenario can be very stimulating for a dog, like playing a game of hiding treats in new places. Such small changes are creative ways to help exercise their mind as they check all the places you might commonly hide treats – past history locations – and eventually they learn a new place that they’ll store away in their memory. In more advanced scenarios, especially when adopting a pup, some owners wonder if their new friend remembers their previous home or companions. Do they have memories of the past, like playing with an old friend, whether canine, feline, or human? This is far more difficult to prove as a fact, since dogs can only communicate (bark) so much. Since it is often the feeling, positive or negative, that the dog associates with past scenarios, it makes it difficult to understand whether they are actually recalling a memory (visualizing the scene in their head) or simply the outcome of the situation and how it made them feel. Take, for instance, dog-on-dog-aggression. This is a growing issue with many pups, especially if they find themselves at the center of an attack early in life. They may never see the dog that attacked or scared them again, but they will often associate the feelings of fear or intimidation with any other dog that physically appears or acts in the same manner. What about dreams? Dogs do on occasion dream. Whether their paws are pattering the air or they are just woofing out a friendly hello to their pals, it is conceivable that their memories do influence what they dream about. Perhaps they remember chasing a ball through the park and catching a whiff of some strange new friend-candidate who just arrived and is ready to play too. Dreams have to come from somewhere, and what better source to tap than a great day with their best friends. So comes the ultimate question: Does a dog have memories of its human companions, both present and past? In this case, it is likely that a dog will always remember those that they love and care about forever. After all, being with you is what they’ve been thinking about all day while you were away. Might Your Pup be a Rebellious One? 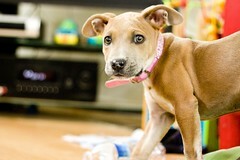 Puppies are adorable and lovable when you first bring them into your home. They listen, study, and follow you wherever you go. They listen to your instructions and often pick up on training surprisingly well. Then things change. That young pup you brought home suddenly decides they are going to do what they want. Basically, your pup has become a teenager. This normally happens when a pup reaches their six month old mark, and will carry on until around eighteen months to two years, depending on breed. Unbeknownst to many owners, this is a naturally rebellious period in their lifetime, but is commonly misdiagnosed as a behavioral problem, such as tearing things up and not listening to you (sound familiar?). What every owner needs to know (especially if it’s your first time raising a puppy) is that this isn’t just a phase they’re going through. Sure, they will eventually outgrow it, but what they learn during that time period will affect their behavior for the rest of their doggy lives. During this time of your dog’s life, they will test you – and all others in their family, at every turn. Everything they will do is a test of your authority. If they feel they can get away with doing something like nibbling or ignoring, it will be a habit almost impossible to break later on in life. One effective strategy you can do with a rebel pup is not to let them have their way. They will test your boundaries, such as grab a snack from unsuspecting hands or go over to the neighbor’s yard when they know they’re not supposed to. They’ll even test you when you’re not present, like open up the cabinets and looking for their treats while you’re at work. This brings us to consistency. If you enforce your training or commands only some of the time, then your pup will begin to realize they only need to listen some of the time. For their safety and that of others, it’s essential that they listen to you every time. Take for instance, the simple act of calling them over to you. Your pup looks up but they don’t come. In fact, they decide to go right back to playing with their fluffy octopus toy. In this situation, it’s easy to simply let it slide because they’re obviously enjoying some time to themselves. But during their rebellious age, that simple act can assure them that they only have to listen to you when they think it’s favorable for them. This dog characteristic could basically be summed up as stubbornness. To deal with this means that you have to be more stubborn than they are. Now this doesn’t mean you have to drag them around or play rough when they aren’t listening. It means that you have to display that you are the one with the authority. Rather than letting your pup play and ignore you when you’re calling them to come inside, it’s time to go get them and bring them inside. To help increase their reactivity to you and your authority, obedience commands should be regularly practiced, even if it’s only for ten or fifteen minutes a day. Have them put the ball down because it’s not play-time – it’s time to listen. By doing this simple act, you let them know when it’s time to listen and when they are allowed to play and do what dogs do naturally – play. Many owners get irritated during this time in a pup’s life. Perhaps it’s because they don’t know what’s going on or simply mistake it for behavior issues. It is a behavior situation, but it’s nothing you can’t work through, as many pet parents will tell you. So never be discouraged that your pup doesn’t listen to you. They are listening, but they’re just testing you by rebelling a little. You have to be patient during this process. Indeed it can be extremely frustrating to deal with a “teenage” pup, but that is a part of being a pet-parent. A well-trained companion is something that has to be worked at. Time must be invested, and patience must be practiced. But as long as you understand what it is that your dog is going through, and you have an idea of what they are thinking (go back to your own adolescent years), you can rest assured that your pup will grow into a well-mannered, highly trained, and extremely happy life-long companion. Growling and Roughhousing – Is It Something to be Worried About? 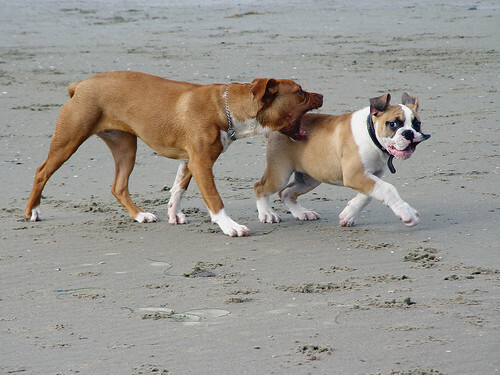 Have you ever noticed your dog roughhousing with others? Do they growl and yip when you play tug-o-war? What about other dogs? Perhaps they’re a little verbal when they can’t catch up with their new friends? Or they go at it with other dogs, rolling and wrestling with them at every opportunity. The fact is that some dogs are naturally more verbal and play a little rougher than the rest. But, on the other hand, there are dogs that are shy about their play habits, which do raise a little concern for dog owners. Basically, your dog is just out to have fun. In most cases, they’re just playing, like players do in physically intensive games. They shout and play rough too. Dogs are naturally the same way and enjoy a good time. Even when playing with your dog, you might hear a little growling and grunting, especially when they bring you their ball and want to play keep away instead of fetch, growling when you try to take it away. Your dog is simply excited, and in most cases will settle right down upon command. When should it concern you? However, there are still dangers to this situation. Because not all dogs like to play rough, you and your roughhousing companion will eventually encounter others that don’t like the way your pup plays. When dogs start yelping, it doesn’t necessarily mean they’re hurt, but it does mean they don’t like the way your dog is playing. There are even owners that won’t want their dog to partake in the activities, which is something you should consider out of respect. As a result, not every dog is going to want to play with yours, even if your dog wants to play with them. And there’s no reason to put yours or anyone else’s dog in that type of situation. Unfortunately, this often means you’ll have to work out safe visits to the dog park or other open play areas, where other dogs will get along with their play styles. But, the real problem with this is that other dogs may have aggression issues. You can’t presume to know the intentions of every dog, and it can be difficult to stop aggression once it begins. And in the case of a roughhousing dog, a playful “gruff” may result in a responsive aggressive attack by another dog, which is never a good thing. Initially, the best precaution is quality training. It’s understandable that in a play-situation such as a dog park with countless distractions, it can be difficult to maintain verbal control over your dog. However, it’s something you should consistently work towards. If your dog is of the roughhousing nature, introduce them into the crowd while still on their leash. At this time, it’s good to practice simple commands, such as sit and stay before they can be allowed off their leash. This helps give you control of the situation, especially if there are other dogs at the area that don’t want to play as rough as yours. You’ll be able to spot them out and help navigate your dog away from them; instead of seeking a compatible friend they can play with. While in a play arena, especially a dog park, always keep an eye on your dog and watch for other dogs approaching your spot. Does your dog know them? Are they familiar? New dogs introduced into the crowd may not enjoy your dog’s roughhousing, so be aware of any new pups. It’s also recommended that you keep a chest harness on your dog, which allows you to get them out of sticky situations in a hurry without having to struggle to get their collar. The harness will give you a good hold on your dog without injuring them (the choking action while pulling on a collar) and it’s much easier to pick them up, depending on how small they are and how much weight you can lift. 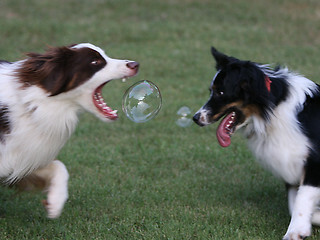 All dogs like to play to some degree, but not all of them want to play rough with others. With a few precautions and proper handling, both you and your dog can find the right friends to play with on a level that’s enjoyable and safe for them. When potty training your pup, it’s important to remember that accidents happen. Much like a small child, your puppy is going to have accidents because of sheer biology. Within 15 to 20 minutes of taking in food or water, their bodies tend to want to eliminate. Sometimes they just can’t make it in time or they are still learning how to tell you when they need to go. Whatever the reason, it’s still important to remember that any new puppy is going to have accidents. However, it’s the way you deal with the accidents that’s so important. If your pup does have an incident, quietly clean it up in a matter-of-fact way. Yelling or punishing the puppy for making an accident may not be the best policy, as it may result in negative behavior. Being supportive and understanding isn’t the right option always either, as it may reinforce that having an accident is “okay.” Instead, ignore your dog as you do it and walk away with patience. It’s going to take a little time.